Of course I put it on the K-1 to see if it showed any vignetting or anything, and to my eyes it appeared fine (tho i do often shoot center weighted). Bruce is still (to this day <sigh>) a little confused to the focal length thing when placing lenses on asp-c (or crop mode on the k-1) vs ff K-1 (35mm sensors). The K-1 gets a wider field of view with the 40mm than the KP does. When I place the FA 50mm on the K-1 it has a narrower field of view than when the XS 40mm is attached. As you can see from the attached screen shots, the 40mm is said to be 'asp-c' in the description (circled yellow), the FA 50mm (circled red) is clearly marked as Full Frame. I always took 'FA' lenses to mean they are Full Frame, and that DA lenses are meant for ASP-C sensor cameras (it's just that some fluke it and work fine for FF cameras). But then, if 40mm on a the K-1 is wider a view than when putting the 40mm on the KP... than what is the KP seeing? 60mm? Or to put it this way, the 40mm on the K-1 has no vignetting in FF mode, is that the 40mm we're seeing, if we chose to use the ASP-C crop mode, we're getting a much narrower view of what is taken in the shot. So then... my DA15mm, it exhibits a lot of vignetting on the K-1 in FF mode, despite seeing the vignetting is that actually 15mm we're seeing? If we use the ASP-C crop and get rid of the vignetting we end up with a narrower shot, so is that then really less than 15mm? Side note, if you use the DA15mm in ff mode and crop manually, you can actually get a wider visible shot than what ASP-C crop gives, but you may get an aspect ratio more like 16:9 or 16:10 rather than 3:2 from it (ie you lose vertical height). Honestly I'm just confused, even writing this I'm making little sense. I just figured the 40mm XS, seeing as it was intended for ASP-C, it would be 40mm on those cameras. If it worked on a FF sensor (ie no vignetting), it's going to be an even wider shot, so it becomes more like a 30 or 35mm? Point is I can tripod the K-1, attach the XS, take a shot, remove the K-1, mount the KP, mount the XS on that, take a shot and now the KP + XS takes a far more narrower perspective/shot (just in the same as if I took the shot in crop mode on the K-1). 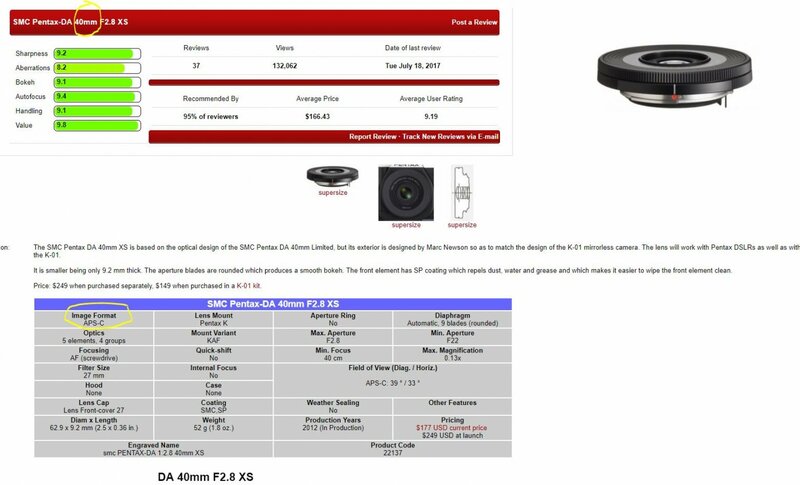 So although the review section of forums mentions 'ASP-C' or 'Full Frame', do we ignore all that, all lenses are FF in mm when describing them ie, despite vignetting or not occurring on FF cameras, when mounting a DA, DFA, FA whatever, it is 'x' mm on a FF, but if it's intended for ASP-C then the usable part is gonna be less than what is described (such as the DA 15mm). The DA 15mm is 15mm with vignette on the K-1, but on the KP the DA15mm is equivalent to seeing a 23mm? If I want a 15mm view like what the DA15mm gives on the K-1 without vignette I need to hunt for a 15mm FF lens? So then is everyone whom is taking pics with the DA 15mm on their KP's, K-5's whatever, really actually showing 23mm shots? The image created by the lens will always correspond to whatever focal length is labeled on the lens. The best way to approach this is to completely forget about crop factor. The only thing you need to know is that full frame will see more of the frame (if the lens covers full frame), so this results in a wider field of view at the same focal length. The whole "equivalence" thing refers to the fact the 40mm on APS-C would look the same as a 60mm on full frame, if you were using both formats. In the case of the DA 15mm, if you were to compare it with the full frame Irix 15mm on the KP, the coverage would be identical. On the K-1, the DA would give you dark edges but otherwise the image would be the same in the areas where it does show up. The focal length stays the same no matter what camera you put the lens on. What matters is the Field of View as provided in the tables you show above. On the K-1 the 40mm has a wider field of view than it has on a KP. On the K-1 it is a modest wide angle lens, on the KP it is a very short telephoto lens. The 50mm lens is a "normal lens" on the K-1, and a short telephoto lens on the KP. Field of View is the key to understanding how the lens would work on a given camera. When I place the FA 50mm on the K-1 it has a narrower field of view than when the XS 40mm is attached. In FF mode for both lenses that is how it should be. It can only ever be a 15mm lens. The narrower field of view is just that...a cropped part of the image. The focal length does not change. Get hold of an old 58mm Takumar. Shoot it on a K-1. Then shoot a 40mm on a KP. Compare. 40mm is 40mm is 40mm. The focal lenght is a characteristic of a lens no matter what camera it is mounted on. When people say of an 40mm lens on an APS-C that it is "equivalent to a 60mm" they are not saying that it is a 60mm on APS-C, but just that the field of view is equivalent. It is unfortunately a bad habit that the industry picked up well before the switch to digital. In 35mm days, everyone knew what a 50mm lens field of view looked like, so it became the standard for discussing field of view. I'll repeat my way of explaining this. Stand in a room at the back wall looking at a mountain range. The only window is 16x24 in this room. (feet, inches, meters it doesn't matter). Now you have another identical room with a larger window - the window is 24x36. You see the same image but you also see more to the sides and above and below. This is how the sensors work when a lens covers both sizes. The DA 40 (including the xs version) is based on a full frame optical design and generally is agreed to do a reasonable job covering the full frame sensor. 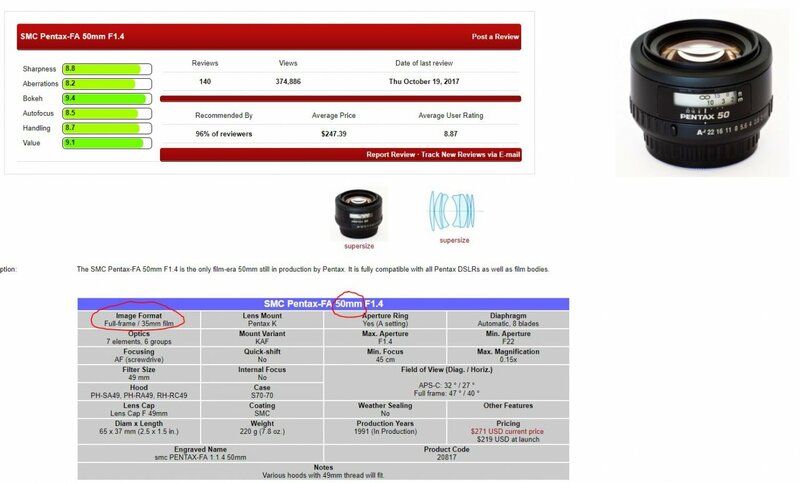 Pentax has not decided to release a profile for the K-1 to treat the lens as full frame for corrections profiles etc. but nothing keeps you from using that lens in full frame mode. The DA 15 as you pointed out is strictly a crop sensor lens. It provides a wide field of view on crop bodies - similar to what you might see using a 22mm or so on a Full Frame (since they see wider for any given focal length). The DA 15mm on a full frame camera cannot cover the entire sensor so this additional width that you would normally enjoy is not as wide as you would expect given that focal length - but another full frame 15 would appear the same in the center of the frame and if you put that full frame 15 on the APSC camera - it would seem to cover virtually (if not precisely) the same area and view as the DA 15. 40mm is 40mm - it is a property of the lens and has noting to do with the sensor size. We express lens focal length in real terms for each lens, regardless of the sensor size the lens was designed for. The Field of View of the lens (the portion of the entire vista in front of the lens projected onto the sensor) is a function of the sensor size. We use ‘35mm equivalent’ as a shorthand to describe the Field of View a lens/sensor combination will capture, expressed in 35mm film terms, only because 35mm film has been accepted as a shared standard most users will understand. When 35mm film became popular, 120 film users (usually used in TLR’s) scoffed at the small film. 645 and 6x7 medium format film, 8x10 sheet film, glass plates - these are also ‘sensor sizes,’ but the lenses are still the focal lengths they were designed, regardless. 40mm is a common TLR taking lens focal length. Pentax / Sony APSc has a factor of 1:1.5, .i.e. the Field of View of a lens on APSc is reduced such that for any given lens on an APSc sensor, a lens 1.5x the focal length would capture the same Field of View on a 35mm sensor. Thus a DA40XS has a 60mm equivalent FoV in FF terms. The DA40XS was designed to cover the APSc sensor. Regardless of whether it ‘works’ acceptably on a FF sensor, It is not truly FF compatible. The FA50 is a film-era lens designed to cover a 35mm (film or digital) sensor. It is, therefore, FF compatible. Talk of equivalence can be confusing because it only applies to the field of view (FOV) due to the crop. The way I think of it is imagining the lens focusing an image onto a special camera's sensor, where the sensor size could be changed at the flick of a switch. If the sensor is full frame sized then the FOV will be the same as on a 35mm film camera. If the sensor is smaller, and ASP-C sized then the resulting FOV will be narrower, similar to cropping an image from a full frame camera. If the sensor was larger, say 6x7, then the field of view would be wider (assuming that the lens could focus an image that would cover that wider area.) But in respect to other qualities of the lens, such as depth of field, the lens has the same properties regardless of the sensor size. So back to your original question, the DA 40mm lens is based on a lens design that goes back to film days, and so it will focus an image on the sensor plane that is big enough to cover a full frame sensor. But when used on a ASP-C camera much of that light falls to the sides of the sensor and the resulting FOV is narrower, the equivalent FOV of a 60mm lens on a full frame sensor. The DA 15mm lens, on the other hand, will only focus an image on the sensor plane that is big enough to cover the smaller ASP-C sensor. So here the crop is not optional (unless you want large black areas around the edges of the image). If we were able to use the DA 15mm on a medium format camera, then the proportion of the sensor covered by the lens would be smaller still. I hope this helps! Remember, a 50mm f2.8 lens is always a 50mm f2.8 lens regardless of what camera type it is used on, just the field of view will change depending on how much the sensor size crops the image the lens produces. Yeah, the DA 40mm should give a narrower FoV than the FA 50mm on K-1. You can set up a tripod and try both combinations, it should prove this point. But photography is very psychological, so you might move differently with the different camera+lens combinations. The other issue is that crop factor might not be precisely 1.5 and the FoV of the lens might not be exactly the focal length written on the lens. The labels are a thing of convention, so on some lenses its very accurate, but not on others. This is why if you buy 50mm lenses, especially from different brands and with different lens designs, they might not have the exact same FoV. But the principle of FoV getting narrower by a specific factor when you go from FF to APSC still stands. To my mind, boriscleto's pictorial explanation is the simplest. The circle is what a lens of a certain focal length transmits to the sensor plane. The red and blue rectangles shows how much of the image circle a full frame and crop camera "sees". It is pretty much what you see through the viewfinder when you put the K-1 into crop mode. You have discovered that the image circle of the DA40 is actually just big enough to fully cover a full frame sensor, albeit imperfectly. The image circle from DA15 is not; in fact it only just covers APS-C. But for all intents and purposes, you can Ignore it. If you like the result from the DA40 on full frame, use it. As long as its image circle is big enough for the sensor in question, a 40mm lens will be wider than *any* 50mm lens, whether either lens was designed for crop, full frame or medium format. Yeah, the DA 40mm on a crop camera will give a narrower FoV than the FA 50mm on K-1.